Although I collect pretty much all Canadian Militaria, my primary passion is medals. When I get a new acquisition into the collection, I research as much as I possibly can. 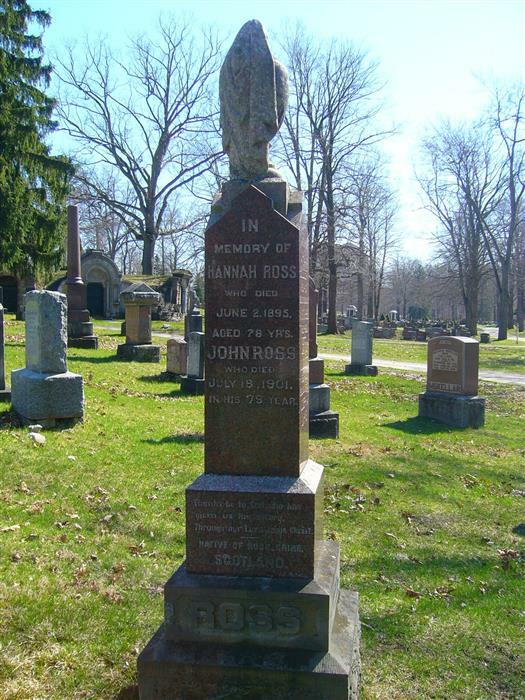 Part of my research involves locating, identifying and photographing the recipients grave marker. I always take at least one photograph of the medals on the recipients grave marker. Sort of a reunite I suppose. The following is a quick recap of my latest excursion. On Monday April 15, after revisiting some of my medal research, I came across two recipients who resided in somewhat close proximity to where I was planning a trip in Southern Ontario. I ran their names through the Ontario Cemetery Finding Aid web site, and came up with the locations of their burials. One in the Hammer, and the other in London Ontario. I contacted the Cemeteries to get the exact location of the graves, within the respective cemeteries. Armed with both locations identified, I finalized my road trip from Ottawa to Hamilton and London. I left Ottawa on Wednesday April 17, bound for Peterborough for a visit with my father. I took a quick side trip to Picton and Trenton on Thursday April 18. The 19th of April, Friday, was my fathers 83rd Birthday so I was staying put. I enjoyed the day sitting around and talking with my father, and helping out around the house getting things ready in anticipation of spring. I am still working around his place. It never seems to end. I left Peterborough Ontario, bound for the the Hammer (Hamilton). I picked up a good buddy in in the Hammer, who I had not seen since his abrupt departure from KAF (heart attack). We went to Woodland Cemetery in Hamilton, to search out, photograph, and pay our respects to James Rycroft. He is buried in Section 20, Lot 270. Simple enough, or so I thought. We noticed that section 20 was quite flat and the rows of grave markers are very nicely laid out. We also noted that the Veterans in this section, all seemed to have a metal cross bearing the soldiers, name number and unit served. This coupled with the fact the Cemetery Records my man was listed as Sgt James Rycroft, (indicting a Veterans headstone) We thought... heck this is a cake walk. NOT SO. We did a fairly quick run though the section without result. No Veterans stone, and no supplemental metal cross was found. The office was closed as it was Saturday, so asking for help was not an option. Ok we are on our own. We went back through the rows a little slower this time. My buddy taking one row and me another, opposite of what we had first done. Still no results. So we changed things up a bit and my buddy moved off to section 20A (which is connected to 20) thinking maybe something was missing. I searched section 20 grave by grave, looking between markers for anything that may be buried in the ground. Finally after what seemed like hours, honestly was only about 1 1/2 hours or so of searching, I finally came across a 'lot number' marker. I made note of the number and location and continued my search. Finally another 'lot number' marker. Looking at the 2 markers in relation to the rest of the section, I was able to narrow my search to about a 20 x 20 foot search area. There buried in the dirt, I found what I was looking for. 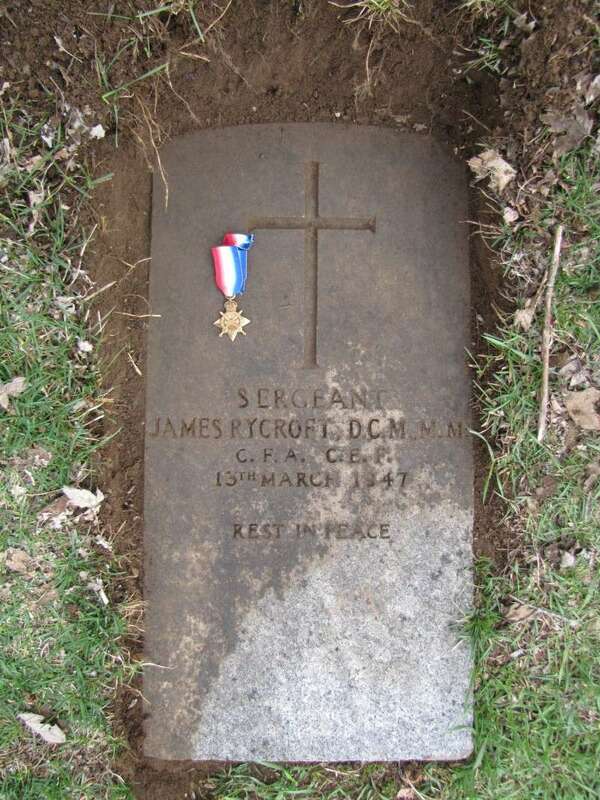 The Veterans stone for Sgt James Rycroft, D.C.M. M.M. RCA. To say the least I was very mixed about this. over the moon I found his marker, but equally unhappy that it was buried. Photo number one was taken when I pushed some debris off this piece of concrete/marble. To reveal D.C.M. M.M. This photo was taken after cleaning all the debris from his marker. You can see the 'wet' line of the stone indicating how much of this marker was under earth, not just leaves. I am not sure if it can bee seen in this photo, but the stone slopes downward so that the top of the stone was buried in about 4 to 5 inches of dirt and debris. This certainly did not happen overnight. This final photo is Rycroft being reunited with his 1914-15 Star. As yet, this star is his only medal in my possession. Soon, I will have his D.C.M. His other medals remain in the wind somewhere. At this point, I will keep it very short I promise. We went to London Ontario from Hamilton, too look for the marker of Albert J Lapine. Although I had his burial location from the cemetery, we were unable to locate it. The section he is buried in has been done haphazardly to say the least, is very large, and has hills and slopes. There are no distinct rows, no unified direction the markers face, no identifiable lot markers, NOTHING. 4 1/2 hours of the 2 of us searching produced not a thing. We left quite disheartened. There was personal at the Office, but as we got there at 1:20 and they closed at 1:00, they would not help us. I work for The Commonwealth War Graves Commission ( www.cwgc.org ) and we carry out some work on behalf of Veterans Affairs Canada. As such, we make arrangements to respond to requests that they receive from the public. Yesterday, I received your request to have the military marker of Sgt. RYCROFT raised and installed in the upright position. Your photos prove that the marker does indeed require the repairs. Therefore, I have contacted the cemetery authorities of Woodland Cemetery (Ms. Fobler) and she is looking into this request for me. I hope to have an answer for you very soon. What cemetery in London was it? Michael, the second cemetery I went to visit on that trip was also Woodland, but in London. The man I was searching for was Albert Jospeh Lapine. After I struck out, I contacted the Cemetery Office in London, and spoke a the lady there. I explained to her my situation, she went out to look for me and low and behold.... I was past his Maker at least 6 or 7 times. Below are the photos she supplied me. 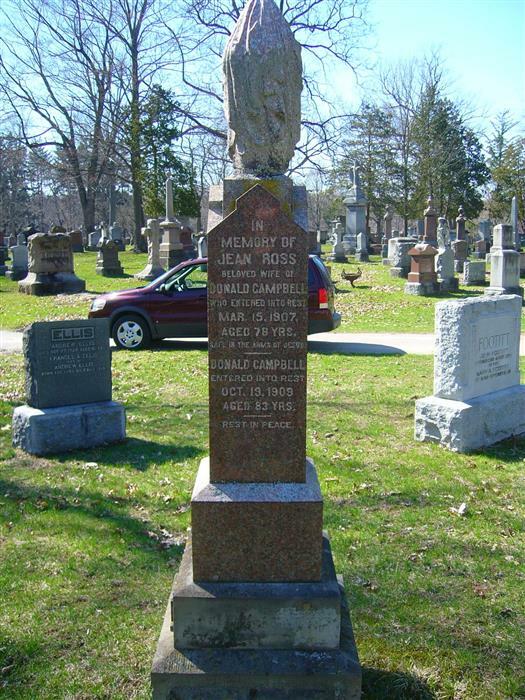 Note one side of the base says CAMPBELL, the other says ROSS. 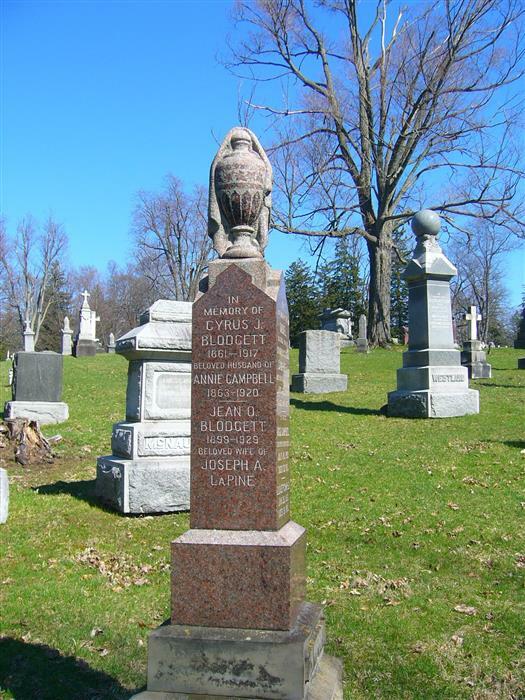 Albert Lapine's name shows up under his wifes name Blodgett. Although he is named as Joseph A. Lapine, and note the lack of a death date. He died in 1967. I thought it might be Woodland..I,ve spent a lot of time in there....there are actually some died of wounds soldiers in there from the First War. Woodland contains the graves of many soldiers and some very interesting and detailed stones. Well I just got word back again from the representative from The Last Post Fund, the establishment responsible for maintaining James Rycroft's Grave marker. I'm writing to let you know that I am finally progressing with the headstone of Sgt. Rycroft. I am in the midst of drafting a contract for the cemetery to install the marker in a permanent foundation as well as have a good cleaning done to the marker. In the meantime, the cemetery caretaker actually took it upon himself to install the marker as an upright, not permanently but stable for the time being. I have attached a photo for you and so you are aware, I have asked the cemetery to complete the repairs no later than the 1st of August. Here is the photograph that accompanied the reply. Great work! Do you have contact information for he folks who took care of the headstone? I'd like to send them a thank you.Message me please. To put this one to rest, no pun intended, I had received word from the Last Post Fund to the effect that this stone in fact had to be replaceed. When I inquired as to why, I was told the stone wold be too short to meet their uniform standard hieght of 32 inches. I was sent a mock up of what the inscription would look like. Although the formatt is a little different, it is what it is. 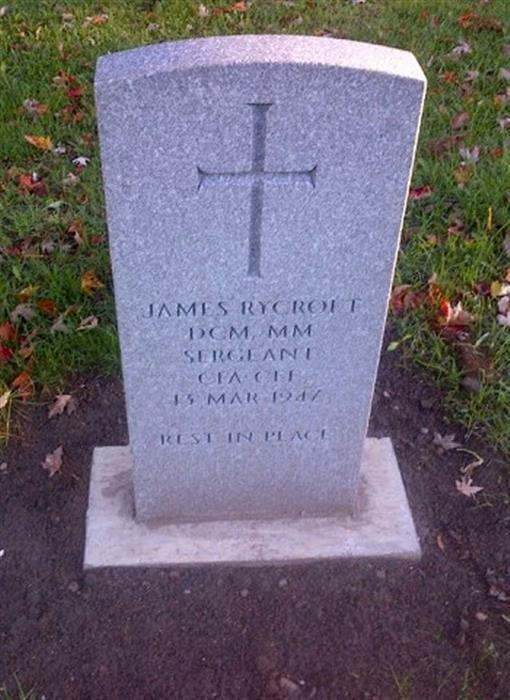 Below is the photo sent to me a little while ago of James Rycroft's new headstone. Update and all sorted out. I got word a while ago that the Grave Marker of James Rycroft has been replaced. I put together, for my own notes, the string of emails and photos that were sent back an forth to the Last Post Fund. This information has been printed out and will stay with the medals group in the future (I hope). Below is a copy of what transpired. I do hope you all all like this this. As usual, any and all feed back is much appreciated. 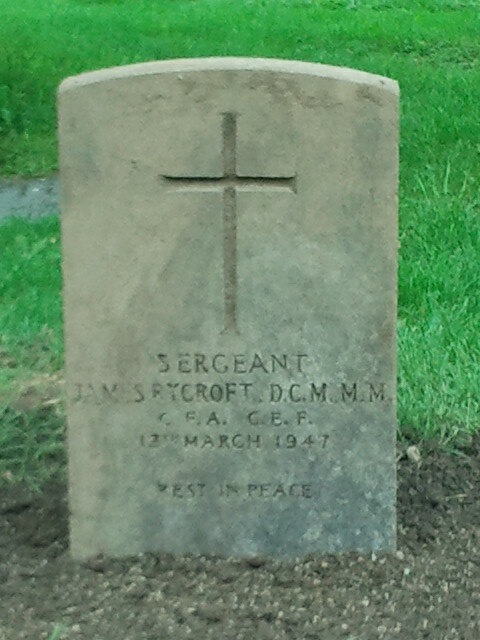 I was searching for the grave marker of Sgt James Rycroft D.C.M. M.M. 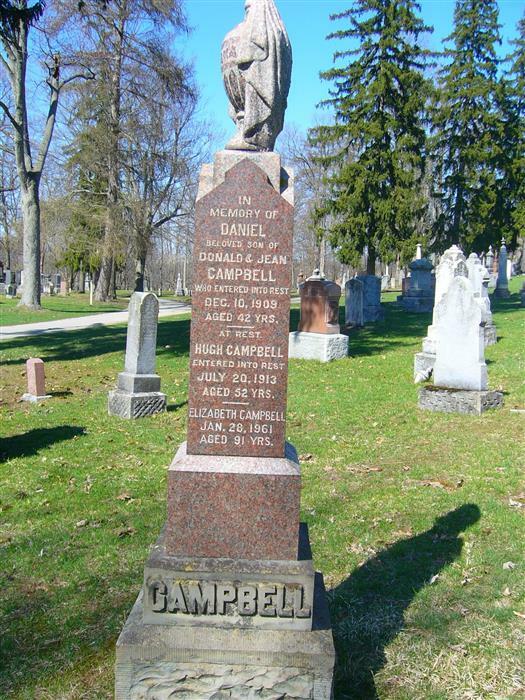 in Woodland Cemetery Hamilton Ontario. The location of his grave is Section 20, Lot 270. I did find it; however it was laying flat and was buried by earth. I am inquiring as to the possibility of this marker being lifted and re installed. The marker, although dirty, does not appear damaged. I have attached 2 photos of his marker. One as I found it, after clearing some earth and debris from it. The other shows the marker in its entirety. 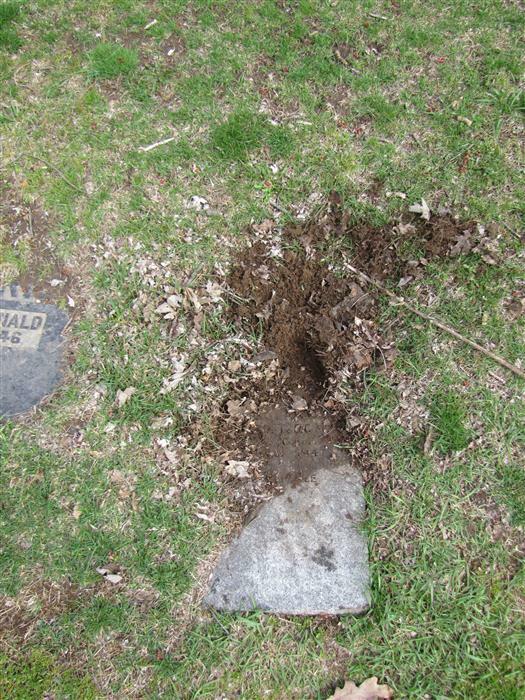 I am not sure if it can be seen in the photograph number 2, however the top of his marker was buried in approx 4 inches of earth. 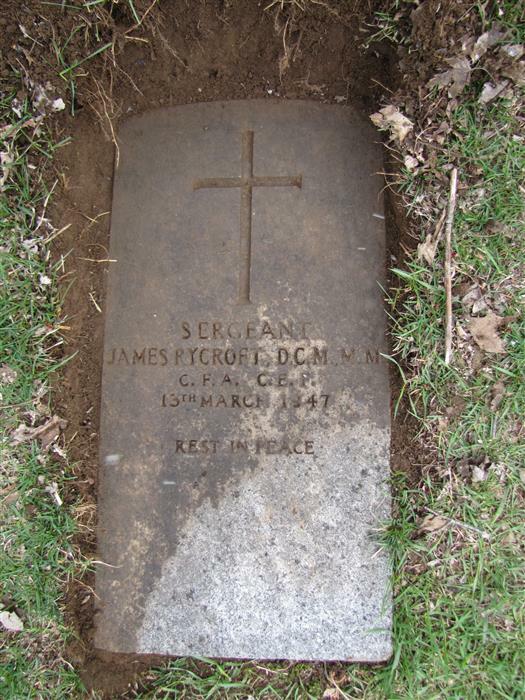 Subject: Fwd: CM request - Grave marker of Sgt James Rycroft D.C.M. M.M. I received the following email from Barbra Ratemo of Hamilton Public Works, after a quick phone conversation. Unfortunately the nature and initiation of the phone call eludes me. In regards to our conversation on June 12th about James Rycroft’s Marker, I have attached the before and after pictures. They were able to dig it up and raise it. I believe that my superintendent has left a voicemail on your 613 *** **** number as well. It is temporarily set right now but will be set in concrete once the paperwork is processed via the War Graves Commission. Subject: Re: Fwd: CM request - Grave marker of Sgt James Rycroft D.C.M. M.M. I've been informed by the cemetery that the marker needs to be replaced and this will be at our expense. I just wanted to advise you of this. Please confirm that you are satisfied with this decision. Thank you for keeping me in the loop on this. I suppose if the marker needs to be replaced, I should be. Last I saw the marker it looked OK. It certainly needed a good cleaning and a footing. I wonder if they indicated what was wrong with the marker that it requires replacement. Yes, I was informed that the marker was too short in order to install it in a new foundation as an upright. Our standard height is 32" above ground once installed as an upright and it was far from that. If you are okay with this, I will proceed with ordering a new marker and the cemetery will install it once received. I also wanted to mention that the layout of the headstone has been changed slightly; still with the same information. I must follow the layout that has been put into place since the existing headstone was produced. Please see attached for a template of the new headstone. Please advise if this is okay. The new format of the inscription does not flow as well as the previous one. Sergeant at the front of his title would be more correct, however, if this is the current way of doing things, then far be it for me to suggest the change. It is unfortunate his service number, 42374, was not included in the original inscription. 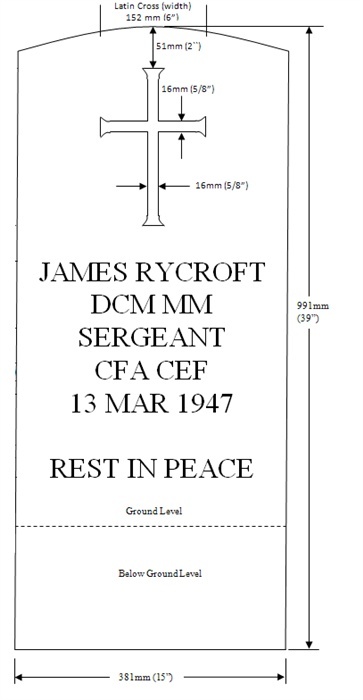 Thank you again very much for keeping me advised of the progress in regards to James Rycroft's marker. I am writing to inform you that I have been notified by the City of Hamilton that the new headstone of Sgt. Rycroft has been installed in the Woodland Cemetery. I have attached a photo for your viewing. Thank you again for bringing this request to our attention. I must say, the timeline involved with this situation was remarkably quick. I found the Headstone on April 20, 2013, and by November 20, 2013, the new Headstone was in place and I had the above photo in hand. That was 7 months to the day. Funny, I just realized I never did a follow up post on James Rycroft, just his head stone. Soon enough, this will be rectified. Great work Cliff, this is proof that at least some of the Government bureaucracy still works in favour of the Veteran. Thanks Ed, I was very pleased with this result. I am also pleased that I was able to add another of Rycrofts medals to my collection. His original D.C.M. came up on the market some time back. 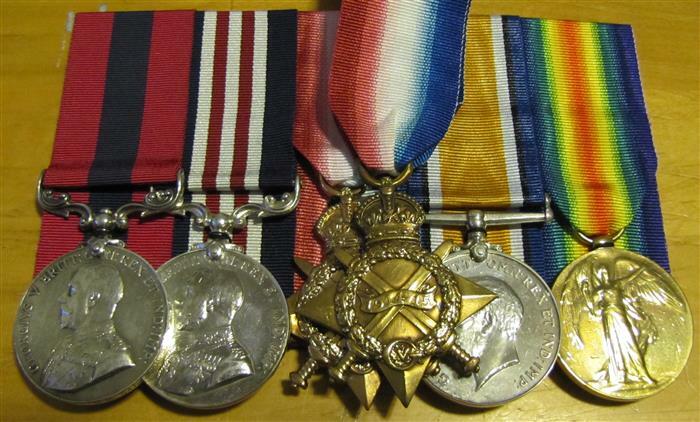 It was mounted with an erased set of medals to fill out his entitlement. I now have his 14-15 Star and D.C.M. I do hope to locate the balance of his originals in time. Below is his grouping as it now stands, with his original Star placed on top. Great work Cliff and congrats on adding another medal to the set. I hope you find the rest soon. I commend you on your work to find the grave sites and then deal with the government to have the grave repaired.